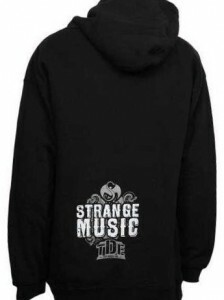 Show some love for Strange Music’s LA ambassador with this Jay Rock hoodie available in M, XL, and 3XL. Made with a 80/20 cotton/polyester blend, this hoodie features “Jay Rock” written on the front with a menacing dog in between and Strange Music and TDE written on the lower back. Click here to order yours today!